160 pages | 81 B/W Illus. Increased environmental consciousness within the scientific community has spurred the search for environmentally friendly processes as alternatives to conventional organic solvents. In the past two decades, numerous advances—including the use of ionic liquids—have made it possible to develop substitutes for some toxic solvents. Ionic liquids are widely recognized as suitable for use in organic reactions and can also improve the control of product distribution, enhanced reactivity, ease of product recovery, catalyst immobilization, and recycling. 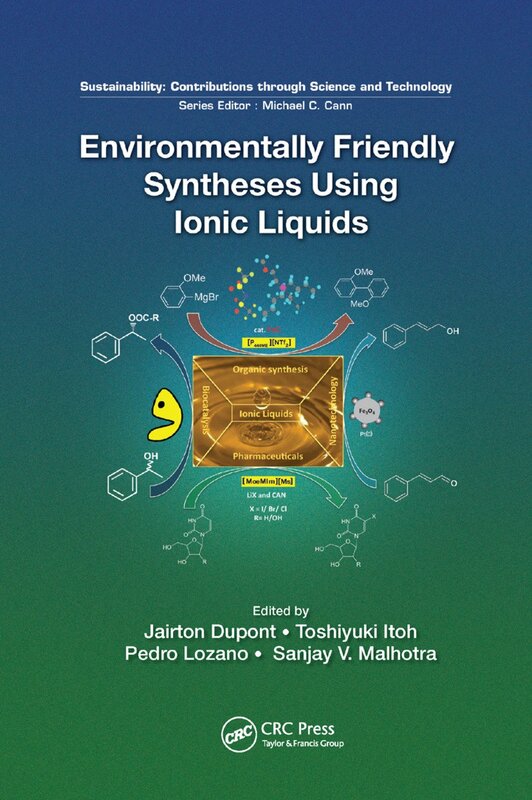 Environmentally Friendly Syntheses Using Ionic Liquids presents the latest developments in the field. It also reviews the latest applications in a wide range of fields including biotechnology, nuclear science, medicine, pharmaceuticals, environmental science, and organic and inorganic chemistry—all from the standpoint of green sustainable chemistry. Growing interest in the field of ionic liquids will define newer and unexplored areas of applications, expanding possible use of these environmentally friendly chemicals. The information presented in this book will undoubtedly help motivate readers to further explore the field. Jairton Dupont is a professor of chemistry and researcher in the Laboratory of Molecular Catalysis at the Universidade Federal do Rio Grande do Sul. Dr. Dupont obtained a PhD in organometallic chemistry from the Université Louis Pasteur. Toshiyuki Itoh is a professor of chemistry at Tottori University. He received his PhD degree from The University of Tokyo. Pedro Lozano is vice dean and professor of biochemistry and molecular biology at the University of Murcia. He obtained an MS and PhD in chemistry from the University of Murcia. Sanjay V. Malhotra is the head of the Laboratory of Synthetic Chemistry at the Frederic National Laboratory for Cancer Research. Dr. Malhotra obtained his PhD from Seton Hall University. Sustainability is rapidly moving from the wings to center stage. Overconsumption of nonrenewable and renewable resources, as well as the concomitant production of waste has brought the world to a crossroads. Green chemistry, along with other green sciences technologies, must play a leading role in bringing about a sustainable society. The Sustainability: Contributions through Science and Technology series focuses on the role science can play in developing technologies that lessen our environmental impact. This highly interdisciplinary series discusses significant and timely topics ranging from energy research to the implementation of sustainable technologies. Our intention is for scientists from a variety of disciplines to provide contributions that recognize how the development of green technologies affects the triple bottom line (society, economic, and environment). The series will be of interest to academics, researchers, professionals, business leaders, policy makers, and students, as well as individuals who want to know the basics of the science and technology of sustainability.